Fresh from the beaches of Catalunya, Brian Parish was ready for the Daggers final push to save their Football League status – well for a week at least before he went back out to Spain. After the glamour and excitement of our European trip a couple of weeks ago, for Dagenham Dan and I, it was back to familiar ground last weekend, for our home game against Bradford. Results after the crushing 0-5 defeat at home to Cheltenham had improved; a goalless draw at Plymouth was followed by an unexpected (but more than welcome) win up at Morecambe. In ten years of visiting Morecambe, I have never seen us win there, as our only victories in that time have come on the two occasions that I haven’t been able to attend. Perhaps I should leave well alone. Last weekend saw the visit of one of the biggest clubs in the division, Bradford City. Their plummet down through the divisions has been well documented, but in an encounter that sort of threatened to get going but never really did, the one moment of quality settled it. Matt Saunders, a recent free agent signing, scored with a beautiful free kick, to earn us the points, despite the dangerous wing play of the Bradford number 32, Kyle Reid. 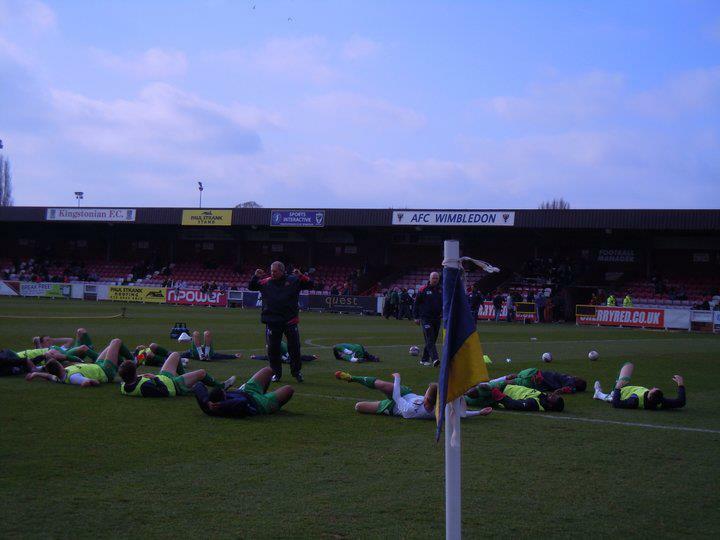 To sum up our season though, Saunders was injured taking the free kick, and so sat out our midweek trip to Swindon. With results improving, there was the hope of getting something from the trip to Wiltshire, but instead all we got was another thumping (0-4), and we lost our main striker to a straight red card, which will mean a ban of three games. All in all, those that travelled have probably had better nights out. And to have to pay £25 for the privilege as well, meant that the night out was probably in the region of around £60. Not good. At least our next couple of away games are a bit closer. In ten days time we travel on the Northern line of the London Underground to High Barnet, for what is becoming an eagerly contested fixture. Today though, we venture to south west London, for a district line derby visit to AFC Wimbledon. 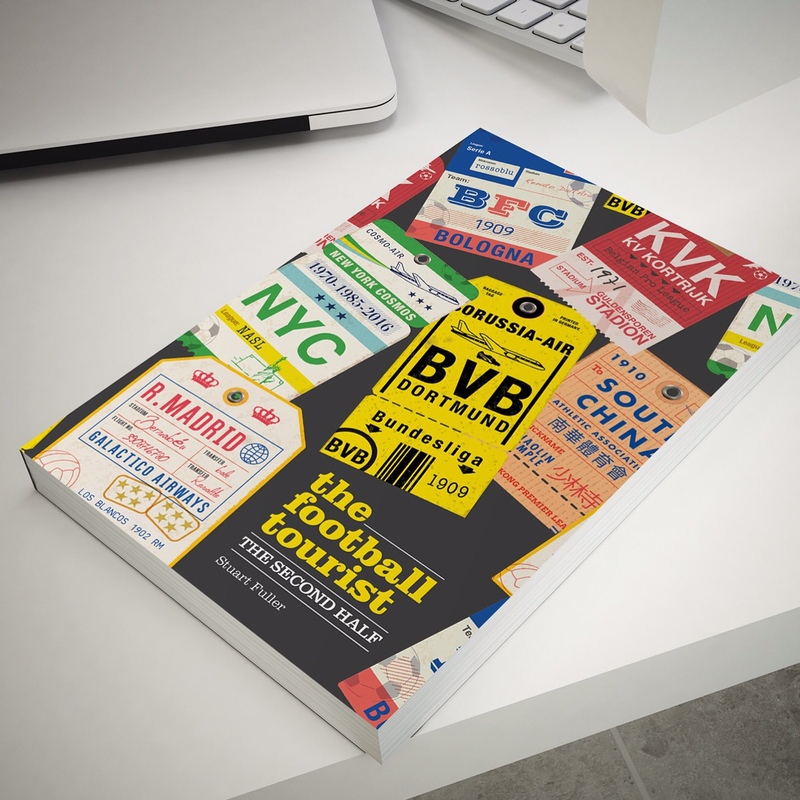 Given that the club was only formed ten years ago from the ashes of the original Wimbledon FC that was shamefully allowed to decamp seventy miles up the road to Milton Keynes, what they have achieved is to be truly admired. I’m not sure if even the most die-hard fan could have predicted the meteoric rise of the club, but here they are, and they are more than coping with the demands of the football league. Their win at our place in August was their first away victory since promotion last May, and so we know that this is going to be a tough day out. However, recent form (3 wins in 22 league games) is not so good, so this is a game that we may, just may be able to take something from. Having got an earlier than anticipated train, we were at the ground (via the long route thanks to our walking pub guide, a.k.a. Graham), just after mid-day. Thankfully when we arrived we were able to get into the clubhouse at the ground, having been advised earlier in the week that this would be out of bounds to away fans. With no colours, we were able to walk in unhindered. However, members of the supporters team that had played earlier in the day were unable to gain entry, so after being directed to the nearest pub by Graham, they were soon joined by Dagenham Dan and Liam, while I went into the stadium. 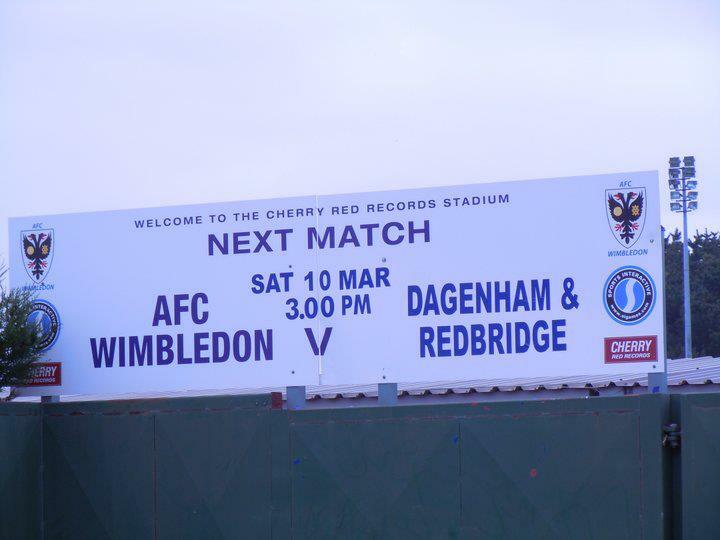 AFC Wimbledon now own the Cherry Red Records Stadium (or Kingsmeadow, which is much easier to type), which means that their original landlords from their formation in 2002 are now their tenants. 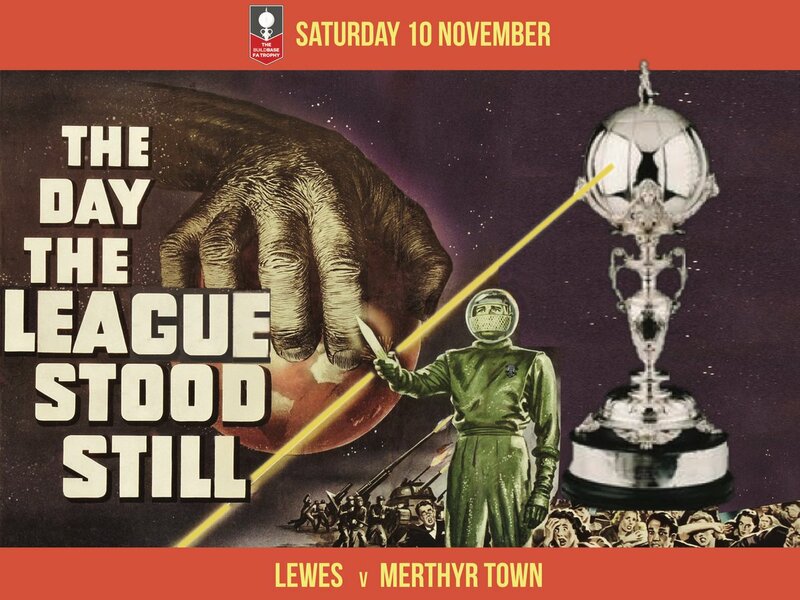 I had been lucky enough to obtain a press pass for this game, and had a pre-match chat with the guys from BBC Essex, Radio Stu and Mick Payne, who is a former goalkeeping coach at the club. It was great to listen to someone who has worked with the club, and their insights into the game. It’s the first time that I have been able to do that, and was very interesting. For example, he pointed out that the current goalkeeping coach wasn’t actually at the game, and that our two custodians (with a combined age of forty) were in charge of their own warm up. Surely this isn’t a good thing for a club hanging on to their status in the football league? The sun is shining as the teams emerge for the start of the game, and with the decent weather, there is the hope for a good game, despite the respective teams recent form. In truth, the first half isn’t the best we will see this season. The home side probably start the better, although after about ten minutes, the Daggers start to get into it a bit more. The visitors are playing with a very high defensive line early on, and it is working, as the Dons are offside three times. However, it would just take one error of judgement, and then we would be up against it. The half now starts to descend into a lull. The only noise being generated in a crowd of just over four thousand is by the Wimbledon mascot, who is being accompanied by a club official around the edge of the pitch, dragging his wheelie bin behind him. Every now and again, the mascot stops, and smashes the lid of the bin up and down, trying to generate some noise. It doesn’t really work though as there are times when it is eerily quiet. There are a couple of high and wide efforts from both sides; Nurse and Reeves are the culprits for the Daggers, while Sammy Moore is the one having trouble keeping his shot down for the home side. As the half draws to a close, the fourth official holds the board to signify one additional minute. The Daggers win a corner, but do nothing with it, and as the teams leave the field, it’s been 0-0. Thankfully, the second half is better than the first. With just one shot on target from each side in the first, it really couldn’t have got any worse, although Wimbledon are unfortunate not go into the lead within five minutes of the restart, as they manage to hit the post twice in about three seconds. This is a huge let off for the Daggers, and they respond a few minutes later, although Billy Bingham can’t keep his header down, and it flies over the bar. It’s not the first ball going over today, and the general consensus is that this is the only place that loses more footballs over the stands than we do. The seventy-second and seventy third minute show how fast a game can change. In the first of those, an in-swinging cross by Jon Nurse is just too far in front of Rob Edmans, who has been on the pitch for about a minute. A goal here would have been great, but within thrity seconds, Wimbledon take the lead. The breakthrough is provided by former Dagger Jack Midson. His sweet left foot volley gives Bond no chance in the Daggers goal, and it gets the home support up and cheering. It is an excellent strike, and not really in keeping with the game so far. Ten minutes later, the away fans have an equalizer to cheer about. A quick break by Daggers sub Rob Edmans results in the ball going to the inside left channel for Brian Woodall, who delays his shot, but does manage to win a corner. From this, a header by Abu Ogogo is cleared off the line, and another corner is eventually won, as another Woodall shot is saved. The next corner results in the equalizer. Damien McCrory’s corner from the right finds Mickey Spillane, whose header creeps into the net, despite Seb Brown’s efforts. The 371 travelling fans celebrate as do the players on the pitch. The winner arrives just three minutes later. A cross from the left is deflected up in the air, and loops directly into the path of Kieran Djilali, who volleys home. It appears that maybe, Jonathon Bond in the daggers goal could have done better, but the outcome doesn’t change; Wimbledon now hold a 2-1 lead. There is just one further chance for the daggers in the four additional minutes allowed by the referee. Edmans, having gone close earlier, gets a header on the ball, but his near post header is brilliantly turned round the post by Seb Brown, and it is this save that will earn the Dons all three points for a 2-1 win. So, it’s back to 24th and last. Having just climbed out of the bottom three, within a couple of games, we are back to the foot of the league. The bottom of the division is quite tight, with eight points separating the bottom seven sides. We are now three points behind the team in 22nd place, which is Northampton, who we just happen to play next. A much worse goal difference will see us remain in the bottom two even if we do win against Northampton, but a win is imperative. Having collected seven points in three games, we have lost the last two. We have eleven games to save our Football League status. Anything less than three points on Tuesday night and it gets even more difficult that it already is. This entry was posted in Dagenham & Redbridge, nPower Championship and tagged AFC Wimbledon, Dagenham & Redbridge, nPower League Two. Bookmark the permalink.